In our last book review, we looked at a book that attempted to tell the story of the Premier League’s first 25 years through the eyes of fans. It ultimately failed – not entirely due to its editor Lloyd Pettigrew it must be said – yet the idea was nonetheless worthwhile. This time around, we have a book that seeks to do a similar thing, but hits its marks much better. Where that book looked to give the opinions of multiple fans, most of them having little of interest to say and generally sounding the same, Savage Enthusiasm is the work of just one writer as he charts the history of football fans from the sport’s inception. It’s very clear that Paul Brown is a football fan though, showing more empathy to his subjects than is typical of football writers – middle class journalists rarely appreciating the issues of the game’s punters unless there’s something in it for them. The book starts quite slowly, due to the lack of information available about early football supporters. Brown details football’s beginnings with the odd line about attendance figures to lead back into his topic. Nevertheless this is understandable as there simply wasn’t much in the way of football fandom to discuss – it’s only once the game is claimed by the working class that the book really picks up, as that’s when the culture around the sport grew large enough to become worthy of discussion. Once it reaches that point in the timeline, the book hits its stride. Quotes with old-fashioned insults and quaint expressions amuse, giving insight into a different time, but it becomes clear as the book goes on of just how little has changed in football fandom since the sport began. The community and excitement the game produces has rarely swayed, instead it’s the technology and society around it that changes how those feelings are expressed. Early examples of hooliganism are documented, showing it wasn’t simply a generation’s moral failing as so frequently insinuated, but has always existed, although the possibility of away day travel through improved infrastructure of trains that made it easier for large groups to invade other towns and cities and reporting by newspapers, previously enriched and expanded by the new literacy of football fans in the Victorian era, looking to exploit the uneasiness of their middle class and older readers, exacerbating the problem. The demonisation of football when its players and fans didn’t want to play their part in the petty squabbles of the aristocracy during World War One also strikes a particular cord today, when “give soldiers footballers’ wages” has been repeated so often it’s become an ironic slogan. The further you get through the book, the more it becomes clear that the story of football fans is the story of working class people just wanting to have a good time being treated with contempt by the middle and upper classes, whether it be the death-trap stadiums never repaired by owners with double-barrelled surnames, rising ticket prices denying working class people a space in those new safer stadiums, or authorities setting police on them to cover up their own failings. It’s the same story of class struggle played out over and over, even if the methods of oppression and fighting back change. Brown is clearly aware of this, noting certain incidents but not going deep into the topics until later in the book. For example, he touches upon the Ibrox Park disaster, but saves the real discussion of such tragedies for when he reaches the eighties, where the Bradford fire, Heysel and Hillsborough disasters make it most appropriate to discuss. The earlier examples are delivered in a knowing way for any reader with a knowledge of the latter, yet their inclusion means that by the time the topic’s discussed in-depth, it’s clear that this isn’t simply the mistakes of an individual decade, but the systemic failures of authorities who have harboured a constant contempt for the people who line their pockets. This subtle delivery is unsurprising for a superbly written book. Each chapter begins with Brown setting the scene of the day of a significant event only to then zoom out and tell the story of whatever topic he wishes to focus on for the era, full of interesting information despite the chapters keeping quite short. Avoiding the trap of nostalgia and the bitter bemoaning of anything modern that infects most writing on the subject, he makes fun of the absurdity of people’s obsession with football without ridiculing it – you couldn’t write an equivalent book about rugby or cricket fans after all. The latter sections of the book suffer a bit due to the fact that it’s already well-trod ground, but the way the earlier sections inform the latter, as well as the excellent writing, ensure they remain interesting. One criticism is that this is a history of British football fans rather than all, with overseas supporters only getting passing mentions – the scope of such a book would be massive, however it would better if there was at least a bit more acknowledgement that the sport has surpassed far beyond the land of its creators in this one. 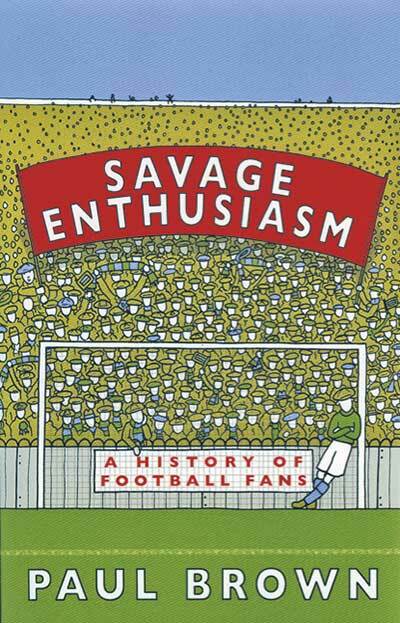 Nevertheless, accessible enough that even those without an interest in football would probably find it enjoyable for the social commentary, Savage Enthusiasm is a must-read for any fan.